This is my 300th recipe post on this blog. Who would have thought! For about three decades, my mom must have thought I'd never learn to cook. One of her favorite stories to tell family and friends is what I used to dish up when she came to visit me while I was still at university in Berlin. These stories, of course, would always go on my expense. But I must be honest, I couldn't cook. Period. I lived off cheese sandwiches and apples. Blogger publishes his/her 7 links on his/her blog – 1 link for each category. I am voting this my most beautiful post because I love the picture: enough detail, good depth of field, good food styling. Love the green background. There are quite a few foods that are not easy to photograph. 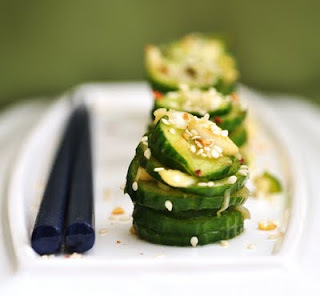 I think, cucumber salad is one of them. I am very critical of my pictures. This is one of very few (if not the only one), that I consider (almost) perfect. That's an easy one, because I just have to check my stats. I must admit it came a long, organic way. Only recently it overtook the Almond Honey Cake which had been leading from the moment I published it. I am not sure if any of my recipes or posts are controversial. 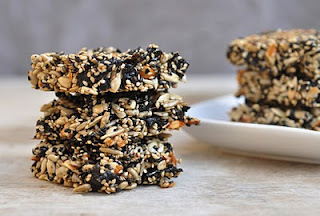 But the Sesame Seaweed Squares are by far the recipe with the quirkiest ingredients list: seaweed, sesame seeds and maple syrup. 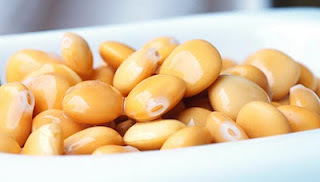 Another post where the stats prove my point: Many people who Google for Lupini Beans end up on my site. It seems to be a snack that is totally unknown in many countries. In other places it is served as street food or in pubs. No-one seems to make it at home. Here you find the recipe. 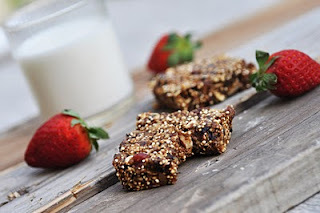 I was telling about my 85-year-old granddad in this post who had just visited me from Germany and actually watched me shooting the pictures for these granola bars. His outlook on life is amazing. Many people commented on this. A very pleasant surprise. 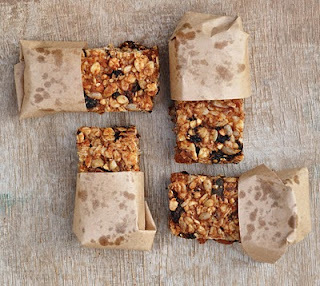 This recipe to me ticks all the boxes: it's raw, it's healthy, it's sugar-free. It can be easily made gluten-free. It's easy to make. 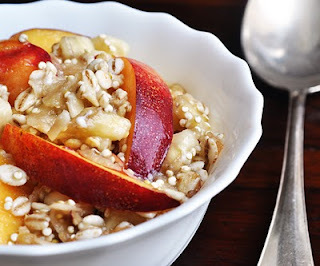 Most people who come to my site are looking for these kind of recipes. This one never really cut it though. My kitchen confidence still wobbles every now and then when I try new dinner recipes. 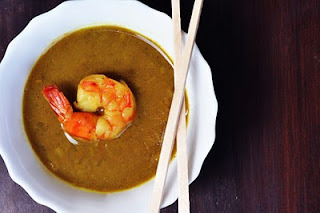 This prawn curry, however, is an absolute hit. I wowed weekday-after-work husband and weekend dinner guests with it. Alright, it's not my concoction, but this recipe is absolutely amazing. What adds to my pride about this recipe is the picture. Apart from cucumber salads, curries are also very difficult to photograph. I thought I didn't do too bad with my picture.